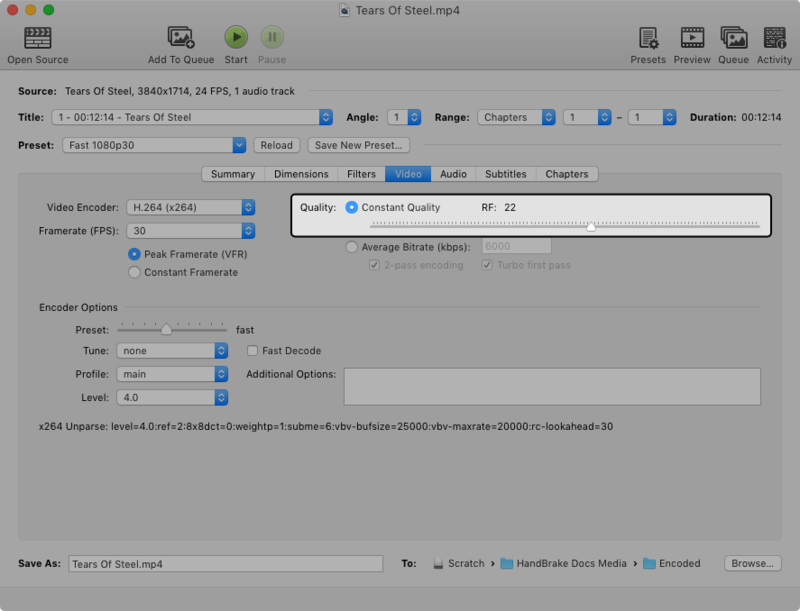 HandBrake’s default settings and most of the official Presets use a constant quality encoding method. This makes your new video look consistent from start to finish. Always use constant quality unless you have a specific reason not to. You can use the default setting for the Preset you selected, or adjust the quality control higher or lower depending on your tastes. Increasing quality will make your new video take up more space on your computer or playback device, whereas reducing quality will typically make your new video take up less space. Most of HandBrake’s official Presets use the x264 or x265 video encoders with a Constant Rate Factor, sometimes abbreviated CRF or simply RF. A lower RF number produces higher quality video, and a higher RF number produces lower quality video. You can think of the RF control in HandBrake as a quality control. To increase video quality, adjust the control toward the right. To reduce video quality, adjust the control toward the left. Adjust the quality control toward the right to increase quality, or toward the left to lower it. Begin by making small adjustments. Plus or minus 1-2 RF is usually noticeable. Raising quality minus 1-2 RF may produce better results when encoding animated Sources (anime, cartoons). Lower quality settings may be used to produce smaller files. Drastically lower settings may show significant loss of detail. Using higher than recommended quality settings can lead to extremely large files that may not be compatible with your devices. When in doubt, stick to the recommended range or use the default setting for the Preset you selected. Imperfections tend to be more noticeable at larger display sizes and closer viewing distances. This is especially true for lower resolution videos (less than 720p), which are typically scaled or “blown up” to fill your display, magnifying even minor imperfections in quality. You may wish to slightly increase quality for viewing on larger displays (50 inches / 125 cm diagonal or greater), or where viewing from closer than average distances5. Reduced quality may be acceptable for viewing on smaller screens or where storage space is limited, e.g. mobile devices. Continue to Previewing your settings.